To say that last week was a difficult week would be an understatement. We ended up eating out a few times and spending all of our entertainment budget for the month (and we still have a little over two weeks to go). Saturday night, we really wanted to order pizza. We were so tired and neither of us wanted to make dinner. Jeff even offered to use his blow money to order pizza. It was tempting. Really tempting but we didn’t do it. We both knew the entertainment budget was gone. We did have blow money but I didn’t want to spend it. We had bought a bunch of groceries in the past few days so we had food. We just didn’t want to make anything. The thought of standing in front of the stove was not at all appealing. I know you’ve had those days. The days when you aren’t sure if your legs would support you to stand in front of the stove to make grilled cheese. I started to think of all the food I had bought that week. I made a Costco run on Friday night. I had stocked up on a lot of things. I could make hamburgers or hot dogs. My knees ached at the thought. Too tired for hamburgers or hot dogs. It was getting late and we needed to eat something. We had no cereal in the house, no lunch meat either. I was starting to cave and was about to tell Jeff to order pizza when a light went off in my head. 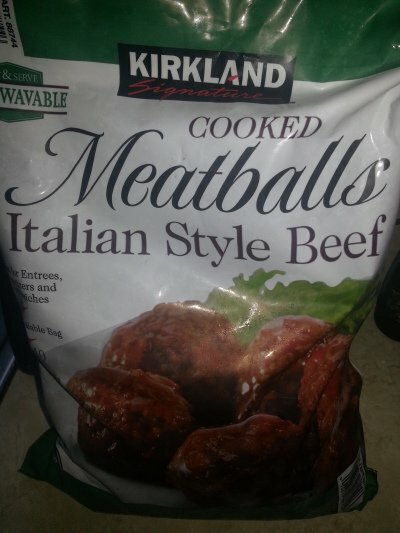 I had a huge bag of frozen meatballs from Costco. I put some in a bowl and thew them in the microwave for a few minutes to defrost them. While they were in the microwave, I poured a jar of sauce in a pan. I sat down as the meatballs mingled with the sauce. Twenty minutes later, we had hot meatballs and sauce, hot dog buns and mozzarella cheese. Three minutes of effort and we had meatball sandwiches for dinner. They might have been the best meatball sandwiches I’ve ever had. Well, they were the best three minute effort meatball sandwiches I’ve ever had. They were really good, really quick and a hell of a lot less expensive than ordering pizza. Since we did not order pizza, I made some pizza dough on Sunday. We will have pizza this week. What do you make when you just don’t want to cook? How do you keep yourself from ordering take-out?